I will explain today implementation for Master-Detail validation rule - new Master record insert is not allowed, if there are no Detail records added. ADF is powerful framework and there are different ways to implement same requirement - complexity is to choose the most suitable and optimal approach. Such validation rule can be implemented in Java, by overriding doDML() method on Entity Implementation class. 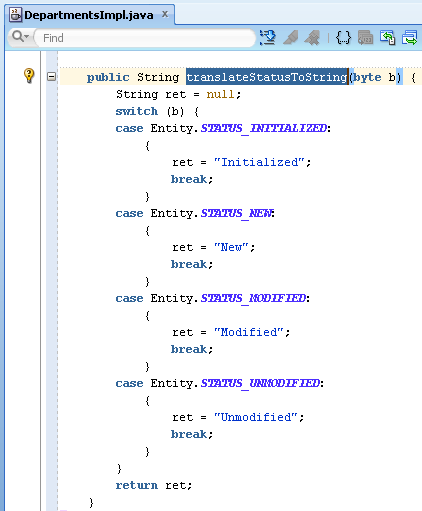 While this works, also same rule can be implemented in Groovy script and declared as ADF BC business rule on Entity. 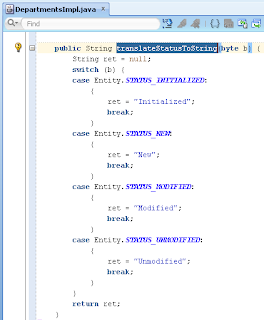 Obviously its better to declare validation in standard way as Entity business rule, instead of coding it in Java logic (at least for current requirement) - it will make code maintenance and changes simpler. 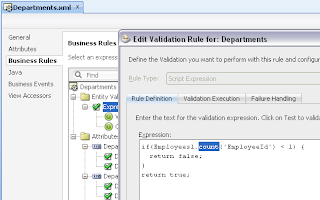 This validation is implemented with Groovy, as Entity level business rule. I would recommend to read more about Groovy from Grant Ronald guide - Introduction to Groovy Support in JDeveloper and Oracle ADF 11g. 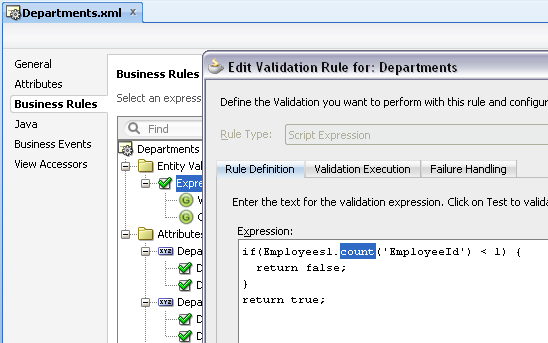 Oracle ADF developer guide how to call Entity Implementation class methods from Groovy - 7.5.1 How to Reference Entity Object Methods in Groovy Validation Expressions. I come from a oracle forms/reports and pl/sql background working in the EBS area for over 15 years. I'm trying to get into ADF. I learned a lot about ADF form your blogs. I know little java and xml so the coding part is not the difficult one. Actually layout part is kinda confusing to me. If you look at this partucilar application, you have tab wirh a show detail item. that part is clear but you have 2 panel group layouts and with layout of horizontal and one with layout of scroll. So can you write few posts on the layout part and that will be of huge help for folks like me. Thanks for idea - I will certainly write on this.